“I want to share the experience that my husband, 7-year-old autistic sister and I had today at the Chili’s location in Midvale, UT. Arianna, my little sister, didn’t waste any time when our waitress, Lauren, greeted us at our table. Arianna promptly ordered her cheeseburger with pickles, french fries, and chocolate milk before Lauren could even take our drink order. Lauren smiled and told Arianna, “Okay! I’ll be right back with your chocolate milk!”. When we got our food, I was wondering why Arianna wouldn’t touch her cheeseburger but was going to town on her french fries. I asked her, “Arianna are you going to eat your cheeseburger?” She calmly said, “No, I don’t want it.” Cheeseburgers, or ‘Krabby Patties’ as we sometimes call them, are her FAVORITE! So this behavior was VERY strange. So I asked her, “Why don’t you want it?”. She replied, “It’s broken. I need another one that’s fixed.” Then it dawned on me why she wasn’t eating it. It’s because it was cut in half. A couple of minutes later, Lauren arrived back at our table with cheeseburger #2. Arianna said, “OH FANK YOU! You fixed my cheeseburger!” When Lauren walked away, Arianna just sat there for a second and looked at her new burger. 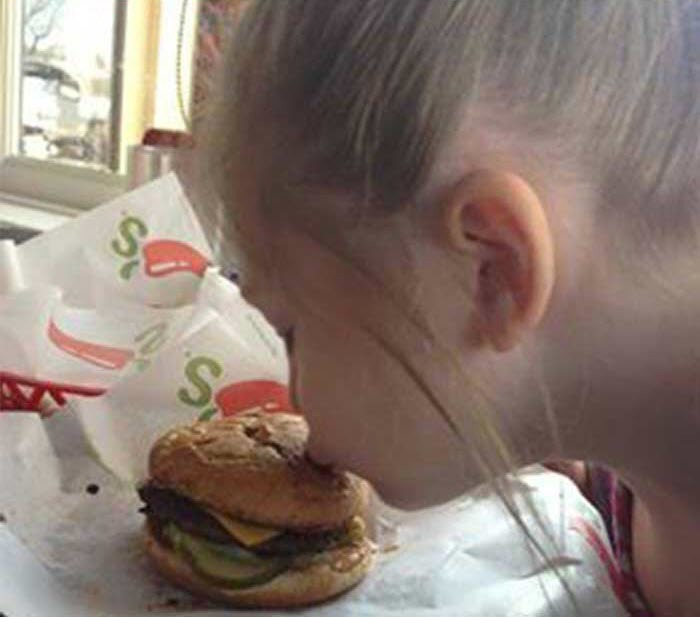 She looked like so deep in thought….just staring at it….then she let out a big “OH I missed you” and started kissing the burger over and over again. I showed Lauren this picture and said, “I think we glorified the cheeseburger too much!” She busted up laughing and asked if she could go show her manager. She came back a minute later and said she showed everyone in the back kitchen area too, and that it made them all laugh and smile. I was so touched by this experience. Especially since I know people, who have been asked to leave restaurants when their child with autism is being disruptive.